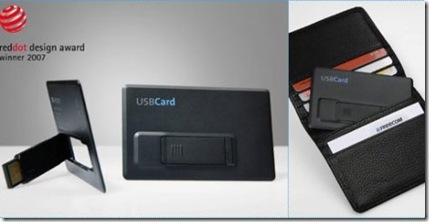 Freecom has has launched thin USB flash drive that sport credit card form factor and claims that this is the slimmest flash drive. The flash drives comes in 256MB to 4GB capacities. You can get this 4GB drive for around 69.99 Euros. The dimensions of flash drive are pretty impressive as it is only 2mm thick so it should easily fit in our wallets. The mechanism to fit the flash drive to the main body also looks good. But I would rather prefer the small factor conventional USB flash drive. Do you prefer a conventional flash drive or unconventional flash drive like this one?